The following document was originally published on Scribd by the Editor of the Grendel Report. Understanding master narratives can be the difference between analytic anticipation and unwanted surprise, as well as the difference between communications successes and messaging gaffes. Master narratives are the historically grounded stories that reflect a community’s identity and experiences, or explain its hopes, aspirations, and concerns. These narratives help groups understand who they are and where they come from, and how to make sense of unfolding developments around them. As they do in all countries, effective communicators in France speaking to Muslim communities invoke master narratives in order to move audiences in a preferred direction. French influencers rely on their native familiarity with these master narratives to use them effectively. This task is considerably more challenging for US communicators and analysts because they must place themselves in the mindset of foreign audiences who believe stories that — from an American vantage point — may appear surprising, conspiratorial, or even outlandish. Some master narratives cut across broad stretches of the French Muslim populace, while others are held only by particular audience sub-segments. This study divides France’s Muslim communities into eight audience sub-segments that demonstrate how different master narratives resonate with different sections of the populace. 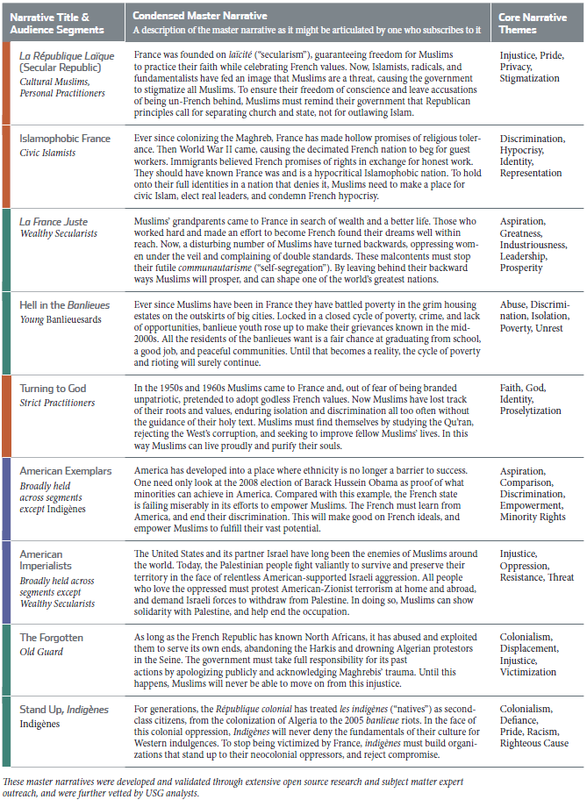 Each of the nine master narratives aligns with one or more of the following segments: Cultural Muslims, Personal Practitioners, Civic Islamists, Wealthy Secularists, Old Guard, Strict Practitioners, Young Banlieuesards, and Indigènes (see the Appendix for a detailed description of these audience segments).